We offer a full range of metal lockers, including steel and iron. 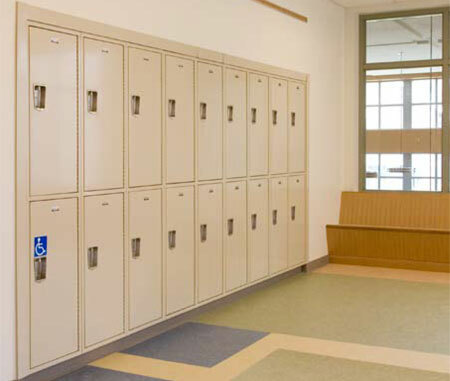 These lockers are not only for schools, but provide perfect solutions for health clubs, recreation centers, hospitals, back offices and break rooms. The powder coat baked enamel finish is available in 24 standard colors. Door frames are welded for lifetime rigidity. 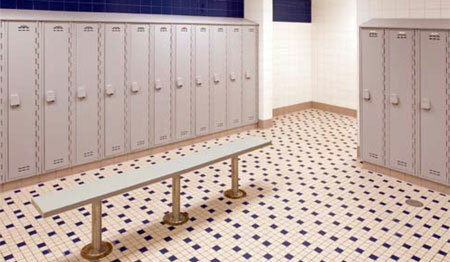 Review our locker options for more information on tops, legs, louvers, handles, locks and more. Plastic lockers are ideal for recreation areas, natoriums, pool areas, athletic facilities, day care centers and employee locker rooms. The plastic material is highly recyclable and releases no VOCs. They are dent and scratch resistant, and are easy to clean after graffiti incidents. The plastic stands up to moisture and many harsh chemicals, and will not absorb gym odors. Stadium lockers are ideally suited for athletic team rooms, fire fighters’ equipment or any other application where easy access to uniforms and/or equipment is required. The open front and visually perforated sides create full ventilation while allocating a specific storage space to each individual. When fully accessorized, it is outfitted with a security box fastened to a full width shelf, and a footlocker with a hinged, reinforced seat at the base. Both compartments are lockable to secure valuable items. Coat hooks and a full width coat rod provide convenient hanging places for clothing and equipment. The front of the footlocker is recessed for an external padlock, and a stainless steel strike plate protects the finish. The footlocker design saves floor space by eliminating the clutter of open locker doors and the need for separate locker room benches. 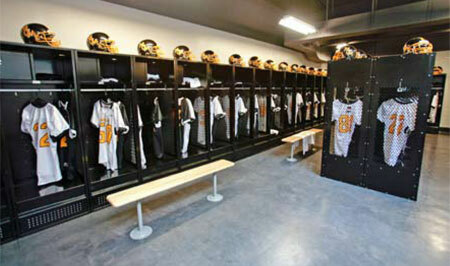 Stadium lockers are available in All-Welded construction or K.D. (knocked down, or unassembled). They are available in 24” or 33” widths and 18”, 21” or 24” depths. K.D. lockers are 72” high; All-Welded models have an integral 4” base, bringing the total height to 76”. Color selection is from any one of Penco’s 21 baked enamel decorator colors. Right for gyms, schools and sports clubs for players and their equipment.